Hello chilly temps, chunky sweaters and delicious comfort food! Soups are a great way to sneak in some extra ingredients that you may not notice but add protein and/or more veggies. Unless you’re eating veggies as snacks every day, it can be hard to get all your veggies in for the day. So how did I do it? I still used potato of course, but instead of using all potato, I substituted some for leeks, cauliflower and broccoli. I also love adding plain, tasteless collagen powder to my soups for the added health benefits. You can learn more about the benefits of collagen powder and where to get it here. Instead of using cream or milk, I used non-fat plain greek yogurt to make it creamier, thicker and add more protein. This ingredient is so versatile and can add lots of low fat protein to your meals. One serving of non-fat plain greek yogurt has 22 grams of protein! Heat a dutch oven or large pot over medium / high heat and add 6 slices of bacon, if using as a topping. Turn every couple minutes until cooked. Remove bacon from pan and set aside. Keep the bacon grease in the pan over medium / high heat and add chopped onion and leeks. Cook for 3-5 minutes. Add garlic and cook another minute. Add the potatoes, riced cauliflower (can be frozen), broth and salt and pepper (keep in mind that the broth, bacon and cheese all add saltiness). Check the potatoes to makes sure they are soft. Turn off the burner and take the top off the pot. Add butter and mix it in. Let the soup cool a little for at least 5 minutes. Using a ladle, remove one big scoop of the "chunky stuff" (potato, leeks etc without much broth) and set aside. Put the rest of the soup into a food processor and add greek yogurt and collagen powder if using. Blend for one minute or so (you can also use an immersion blender but I find the food processor works better). Serve topped with broccoli, crumbled bacon, chives and shredded cheese. Add all ingredients except for greek yogurt, butter and toppings to the slow cooker. Once cooked and potatoes are soft, take off the top, mix in butter and let cool a little while you cook the bacon in a pan and set aside. Remove one ladle of the "chunky stuff" (potatoes leeks etc without much both) and set aside. Add the rest of the soup to a food processor along with the greek yogurt and collagen powder if using. Blend at least 1 minute (you can also use an immersion blender but I find the food processor works better). Return to the pot with the scoop of chunks you set aside earlier. Serve warm topped with bacon crumbles, steamed broccoli, chives and shredded cheese. I can devour a pot of this in 24 hours. And you know what? It’s okay because it’s low carb and whole 30 approved! (Thank God). There’s nothing better than a creamy, hearty, warm and satisfying winter meal that is actually healthy. I am legit making this on repeat this winter. I can’t get enough! 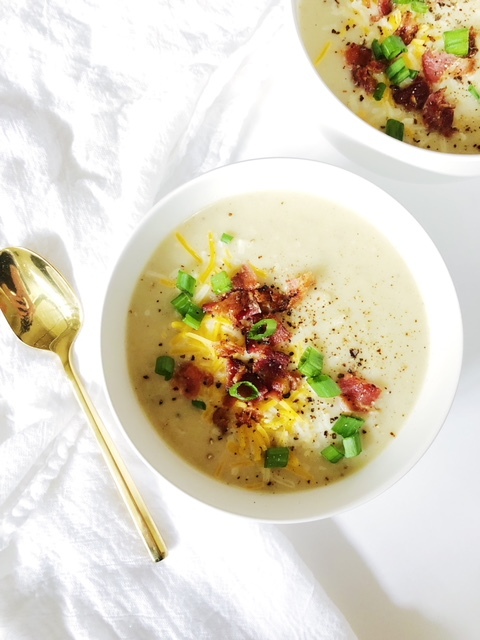 So how is this soup creamy, low carb and whole 30 approved? I know. I can barely believe it myself and you’ll doubt me when you taste it. But I promise. It’s awesome AND good for you. 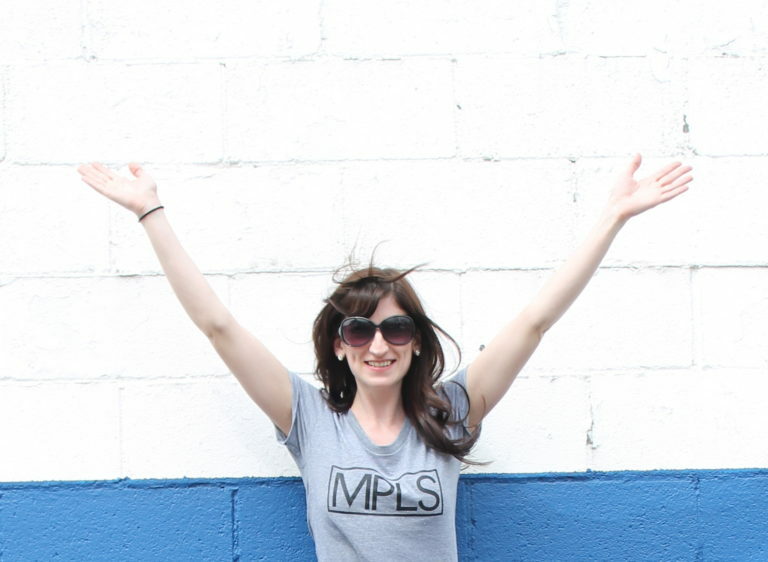 New to whole 30? Read about it here. 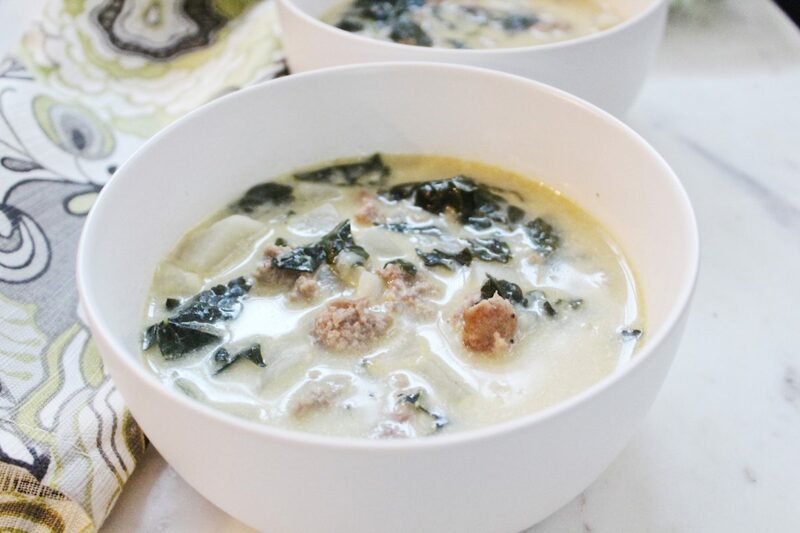 I modified the traditional zuppa toscana recipes by replacing potatoes with turnips. Why? They’re lower in carbs/starch and have more nutritional value. Potatoes are allowed on whole 30, but are starchy and higher in carbs. What is a turnip you ask? I had been confusing a parsnip and a turnip for years until I actually went to buy a turnip for this recipe! Turnips are a white root vegetable shaped like an onion. They have an almost waxy outside which I peel off and cut into chunks like a potato. Turnips are rich in calcium, potassium and phosphorus. Plus they are high in fiber and low in calories. Honestly, I can’t even tell the difference between a turnip and potato in this soup. Another modification I made to the recipe (for a whole 30 option) is to use coconut milk in place of cream. Buy the canned kind and use the thick part of it in the soup. Coconut is high in saturated fat but is a plant based fat making it WAY healthier than animal fat (plus multiple other health benefits, besides being non dairy). If you’re not doing whole 30, go ahead and use the cream! A little cream never hurt anyone. Everything in moderation, right? The last couple things I did to make this soup healthier is use bone broth in place of regular broth. I’ve talked about this before and I do it in all of my soups. To learn more about the benefits of bone broth read this post or this one. The last modification I made is to use turkey sausage in place of regular sausage for a leaner option without sacrificing flavor. Note: everything in this recipe is whole 30 approved except for the cream. If you’re doing whole 30, that’s the only modification you’ll need to make. In a large pot brown the turkey sausage in olive oil. Add garlic and onion and cook another 5 minutes. Add broth and diced turnip and simmer covered for about 20 minutes. In a bowl mix cream/coconut milk and starch with a whisk. Stir mixture into soup and add kale. Also add nutritional yeast and seasonings. Cook another 20 minutes on medium/high heat. Add turkey sausage to the bottom of the crock pot and add the rest of the ingredients except for milk, kale and tapioca flour. Cook on high for 4 hours or low for 8 hours. In a bowl mix cream/coconut milk and tapioca flour with a whisk. Stir mixture into soup and add kale. Cook another 20 min on high. Enjoy! Yes it’s chili season here in Minnesota. 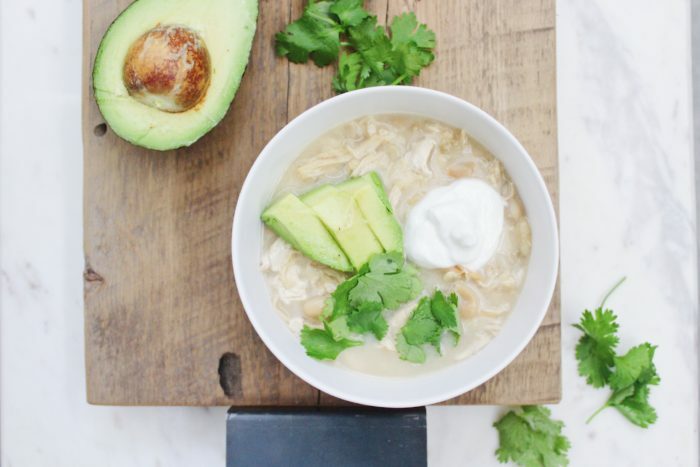 We love a traditional chili over here, but let me tell you this white chicken chili is SO GOOD! This recipe is Travis’ all-time favorite recipe of mine. So good we make it all year round. The soup is pretty simple. It can be made in the instant pot, crock pot or stove top. Besides being super delicious and a warm comfort food for fall and winter, it’s got some added health benefits! I’m always looking for ways to add ingredients that make my recipes healthier. If you’re not familiar with bone broth, you can read about it’s benefits in my post about cauliflower broccoli soup. Basically, bone broth has more protein, collagen and other nutrients that are great for your joints and also helps boost the immune system (which we can all use in the winter!) 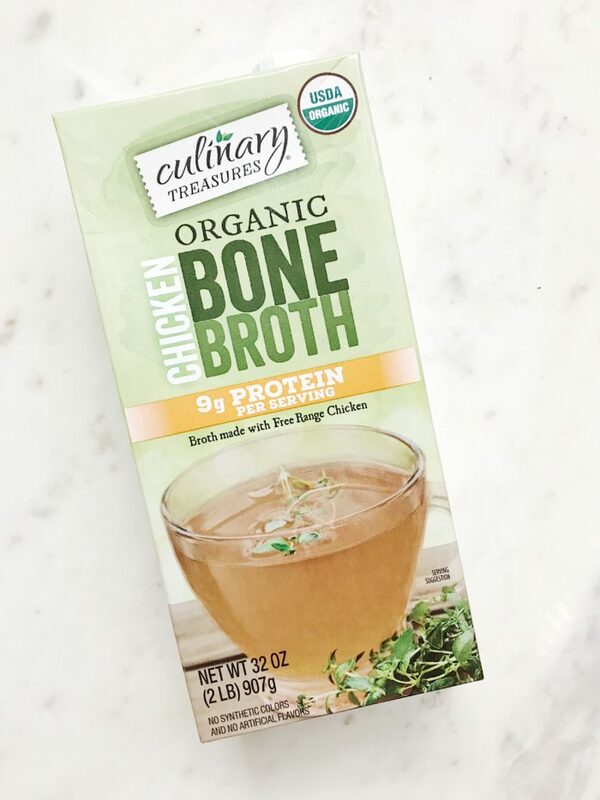 We buy our bone broth from Costco (photo below), but I’ve linked a similar one here. If you’re ambitious enough to make your own, check out my friend Kate’s post all about making your own bone broth. *Note: sometimes I post links to products for which I get a small commission if you purchase through me, at no extra cost to you. Sometimes I share a product just because I really love it and want others to enjoy it too. Either way, I only promote products I have tried and truly value. Thank you for your support! A couple other ways I make this soup healthier is by adding plenty of garlic, which also boosts the immune system (and tastes delicious!) I also use non-fat plain greek yogurt in place of sour cream. Greek yogurt has WAY more protein than sour cream, it’s non-fat and I promise you can’t tell the difference in your chili! If you have not purchased an instant pot yet, you need to! I have replaced my crock-pot with this fabulous kitchen tool that can be used for SO many things. 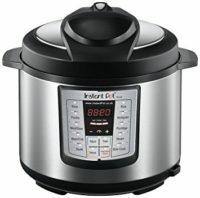 The instant pot can slow cook, pressure cook, saute, cook rice, yogurt, oatmeal and more! I have taken chicken right out of the freezer and cooked it 15 minutes with this thing! It is well worth the investment. I got a great deal on mine here. I’ve included all the ways you can make this chili in the recipe box below: instant pot, slow cooker and stove top directions. Tip: for a more convenient option, grab a rotisserie chicken from the grocery store and shred. Then skip the first instructions on cooking the chicken and jump ahead. Add chicken breasts to the instant pot with ½ cup water and season with salt. Hit the “poultry” button and adjust to 12 minutes (if you’re cooking the chicken right out of the freezer add 3-5 minutes). Prepare everything else while the chicken is cooking. When the instant pot beeps complete, let the pressure valve drop naturally or turn the valve to “vent” to release pressure quicker. Drain the excess water and shred the chicken with 2 forks. Add bone broth, beans, garlic, onion, salt and pepper to the instant pot with the shredded chicken. Season with salt and pepper, but keep in mind the salt that comes from the cans of beans, broth and cheese that you’ll be adding. Press “manual” on the instant pot and adjust time to 20 min. Stir in shredded cheese until melted. Serve topped with sliced avocado, a dollop of greek yogurt and fresh cilantro. 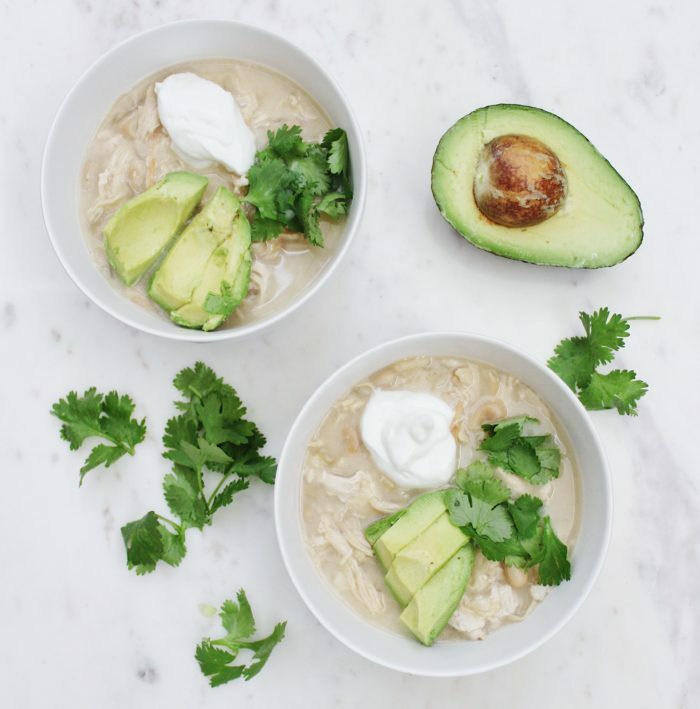 Add all ingredients except greek yogurt, avocado, cheese and cilantro to the slow cooker. Once cooked, shred the chicken with two forks. Add the cheese and stir in until melted. Serve topped with avocado, dollop of greek yogurt and fresh cilantro. Add broth to large pot over high heat and bring to a boil. Add chicken, turn down heat to medium/high and cook covered for about 10-15 minutes. Add onion, garlic, beans and salt and pepper and simmer for another 20 minutes. Stir in the cheese until melted. Serve topped with sliced avocado, a dollop of greek yogurt and fresh cilantro. Put just about anything on an avocado and you can sign me up! Chicken salad makes a perfect meal for lunch and bonus: it’s easy to pack up for work. 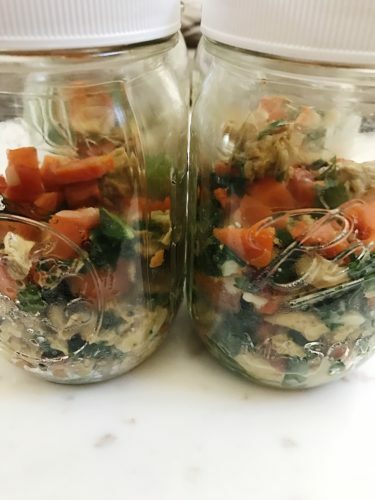 This chicken salad recipe is low in carbs and high in protein, which I love because it fills you up and helps rebuild muscle for athletic girls like me. I use 50/50 greek yogurt and mayo to cut some of the calories and add protein without sacrificing flavor. Summer is right around the corner so I’ve been stepping up my toning exercises (I love barre classes!) and using heavier weights, which means I need high protein meals to rebuild that muscle. Chicken salad is perfect for that! After that hard work in the gym, make sure you don’t load up on too many carbs or unhealthy fats and undo your workout! Add fresh chopped romaine or spinach to get more veggies and throw it on an avocado half. If you’re bringing an avocado half with you on the go, put a little lemon juice on it to prevent it from turning brown. Trav and I are currently doing the Whole 30 (we’ve made it to day 19!) It’s been a great experience for us, but the hardest part is meal-prepping and making sure you have meals and foods on hand that you can grab and go. 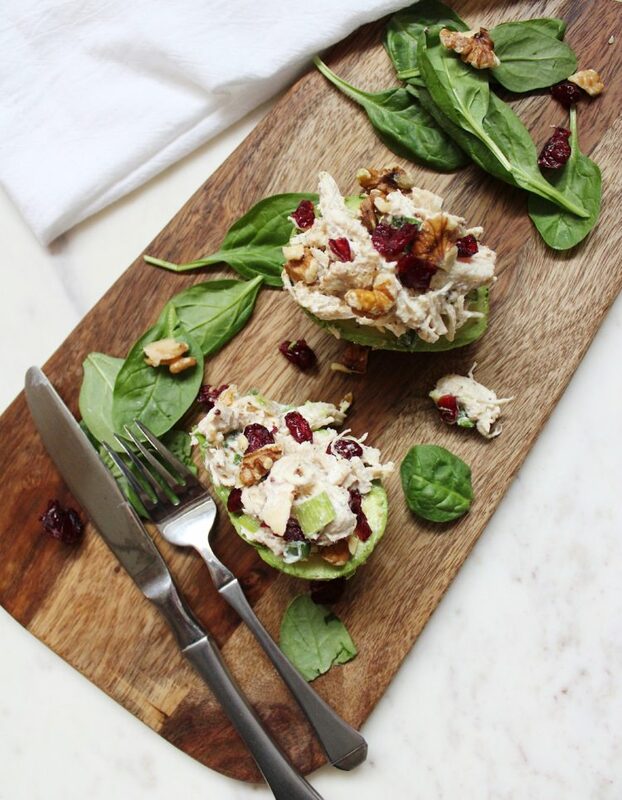 Chicken salad like this one is perfect for packing ahead of time. So, Whole 30-ers or Paleo peeps, you can substitute the mayo and greek yogurt for a whole30 approved mayo like avocado mayo or make your own at home to make this recipe whole30 friendly! Heat a pan over medium heat and add a drizzle of olive oil. Season chicken breast with salt and pepper on both sides and cook in heated pan. Cover and cook 5-8 minutes on each side. Shred the chicken with 2 forks in a large bowl. Mix together the rest of the ingredients (except avocado and greens) in the bowl until well combined. Divide the romaine or spinach between each plate. 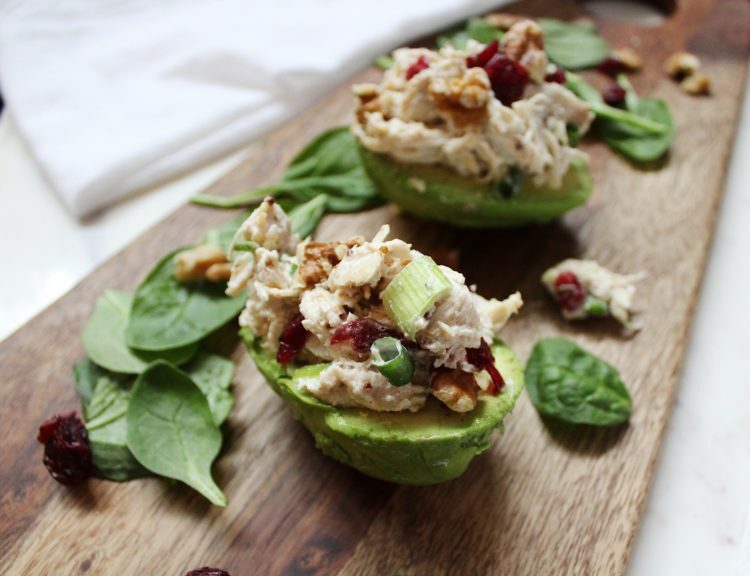 Add a large scoop onto each avocado half and plate. Serve cold. Anyone else have a hard time getting a good breakfast in the morning during the week? It seems like there’s never enough time in the morning to cook a good breakfast so I find myself grabbing a bar as I run out the door. 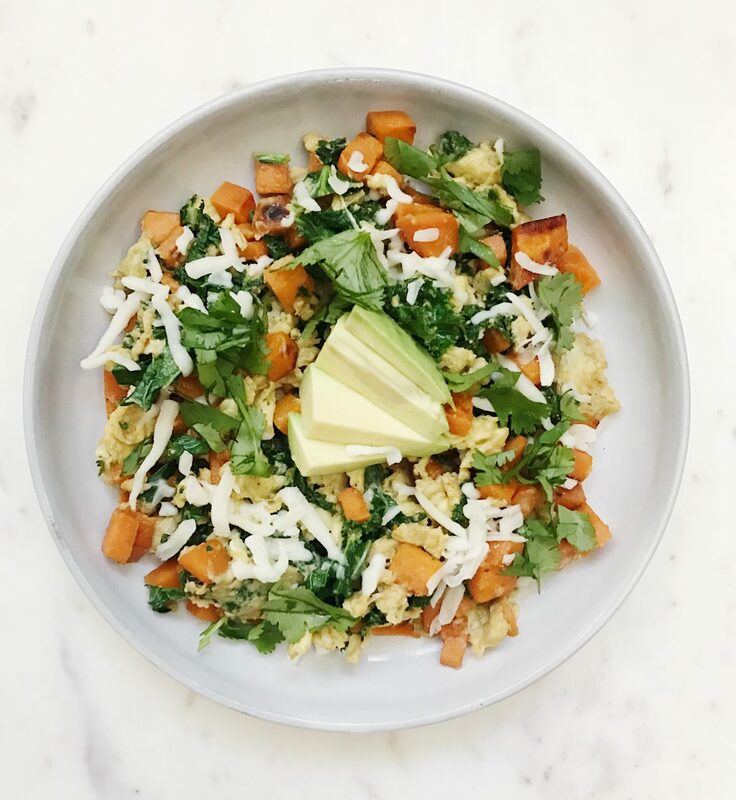 I made this breakfast hash as a meal prep for quick healthy breakfasts you can grab and microwave – no cooking or prepping necessary the day of. If you have a job where you can eat your breakfast hash when you get to work then throw the mason jar in your bag and bring it with you! 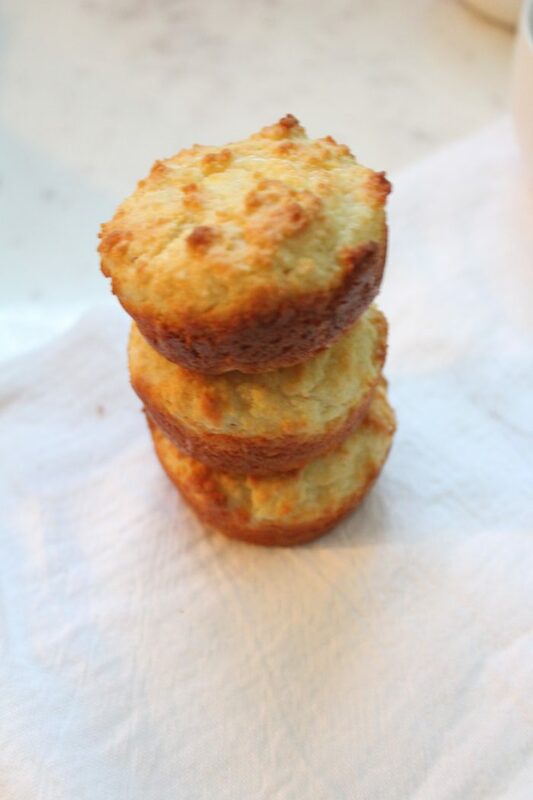 While I intended this to be a meal prep recipe, it makes a great weekend breakfast too. 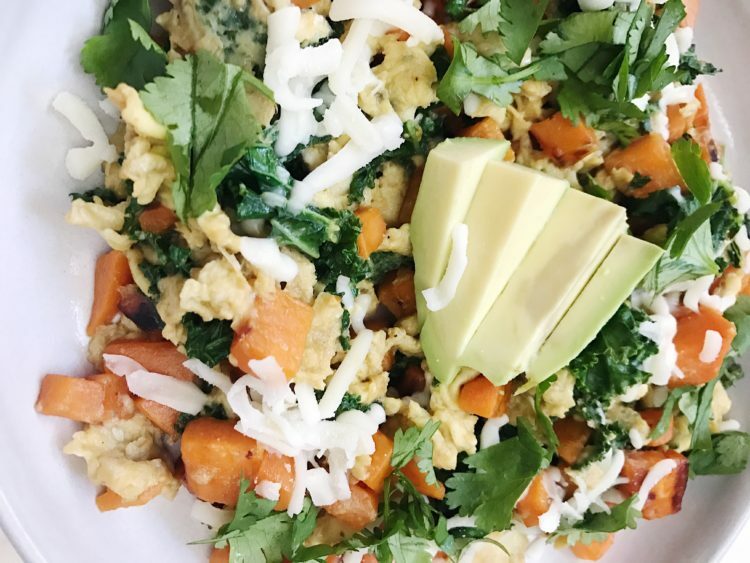 Sweet potato makes all the difference in this breakfast hash. Not only does it give a nice flavor and texture, it’s healthier! The fiber and protein of sweet potato keeps you full through the morning. 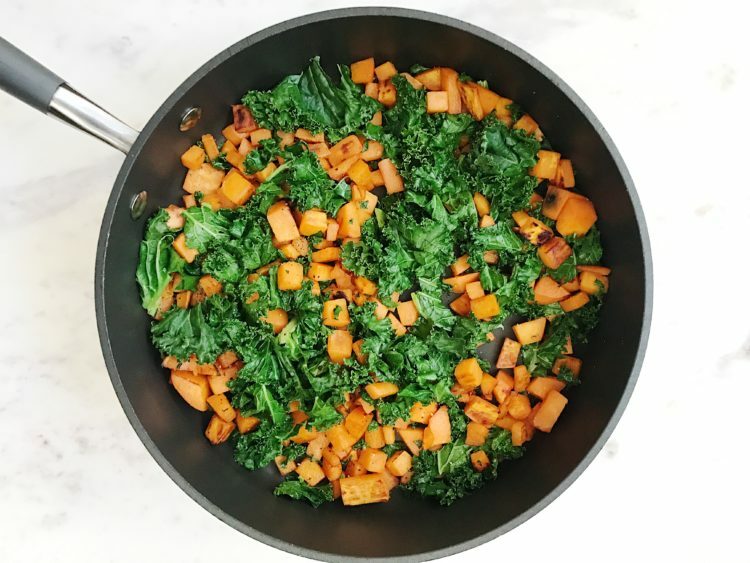 Kale is FULL of vitamins and I love to quickly chop and throw it into these types of dishes for an extra serving of veggies. Plus that dark green is so pretty! I got about 4 servings out of this, which I put into mason jars and stored in the fridge to grab in the mornings. If you’re on the go, wholly guacamole single serving packs are awesome to add in after you’ve heated it up. Tip 1: dice the sweet potato into pretty small pieces so they cook faster. Tip 2: I found these easy white, screw-on tops for mason jars on amazon. I like them because they’re easier to clean / use and they don’t rust. You can find them here. Saute sweet potato in olive oil over medium high heat for about 7 min stirring occasionally. Turn down the heat to medium. Whisk eggs together and add to the pan, stirring frequently. Just before the eggs are fully cooked, take the pan off heat (they will continue to cook another couple minutes) and stir in the cheese. 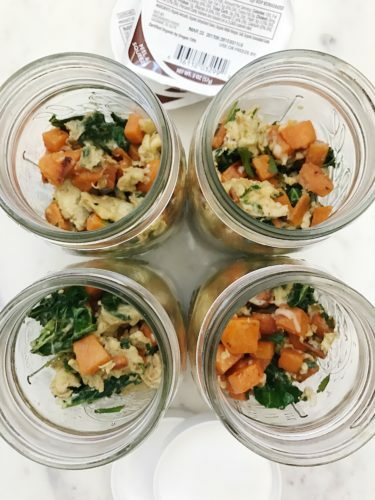 Divide into mason jars or serve on plates and garnish with avocado and cilantro. Enjoy! Sushi is definitely one of our FAVORITE foods. I think we could eat it every day. Going out for sushi is so fun, but it’s a difficult and expensive thing to make at home. That’s why I came up with this sushi bowl. It’s an easy way to make a sushi-like dish at home, plus it’s low carb! Also, it’s pretty with vibrant colors and lots of healthy raw veggies! 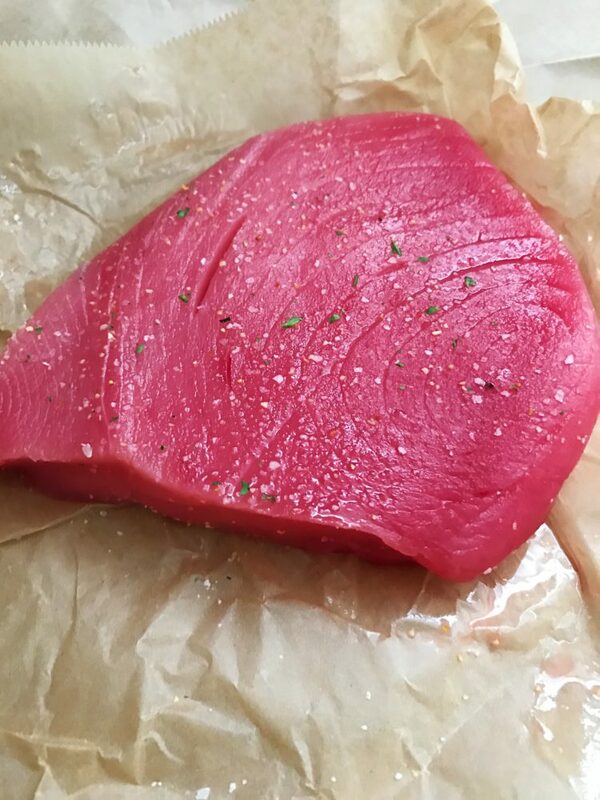 Seared ahi tuna is the protein I chose for this dish. You could also do shrimp or tofu for a vegetarian option. Bonus: minus the fish this dish is entirely vegetarian, vegan, gluten-free, grain-free and dairy-free! The spiralizer makes this recipe super fun. The base of the bowl is cucumber and carrot spiralized. It changes the texture and composition of the bowl when it’s spiralized vs chopped. If you don’t already have a spiralizer, I love this one! It’s so versatile. 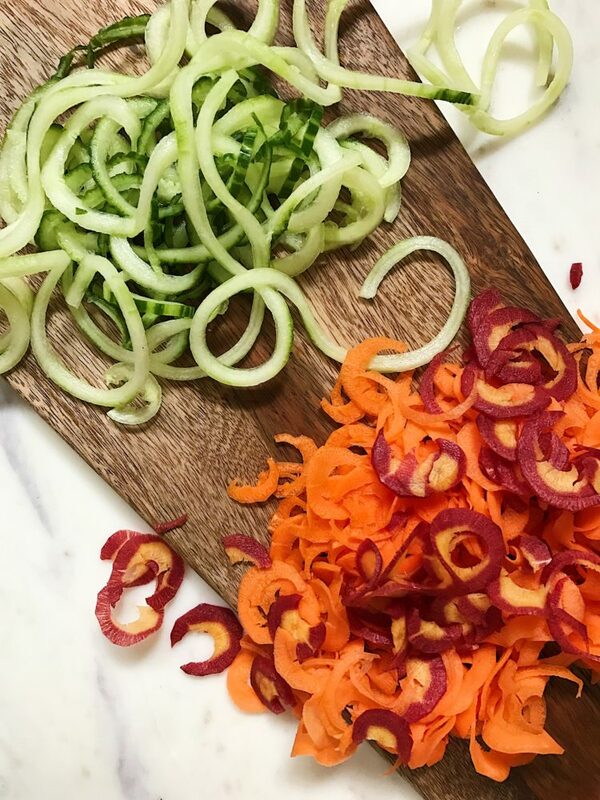 You can switch things up by using a spiralizer for all kinds of veggies! Zucchini, sweet potatoes, butternut squash, cucumber, carrots etc. I highly recommend. Peel the carrots and cut off the end where it gets really skinny. Spiralize the cucumber and carrots. 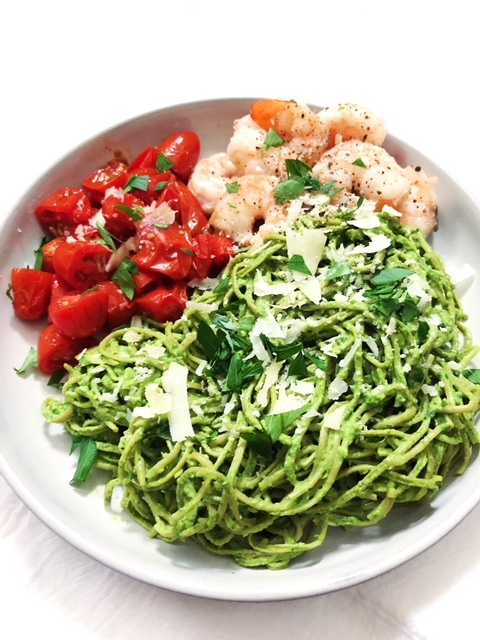 If you don’t have a spiralizer yet, I love this one! 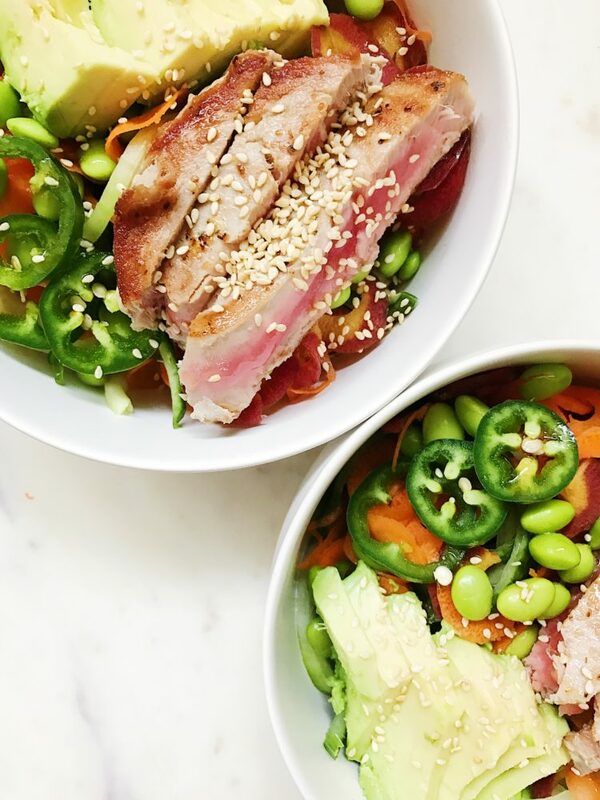 Prepare the bowls with a mixture of the veggies, edamame and avocado so they’re ready to top with tuna once cooked. Season the tuna on both sides with sea salt. Sear tuna about 3 min on each side. The middle will be pink. Slice the tuna into strips and add to bowls. Divide the dressing between the two bowls and top with sesame seeds. I am a big fan of recipes using something that can be stuffed. It opens up room for creativity and it’s pretty tasty too! 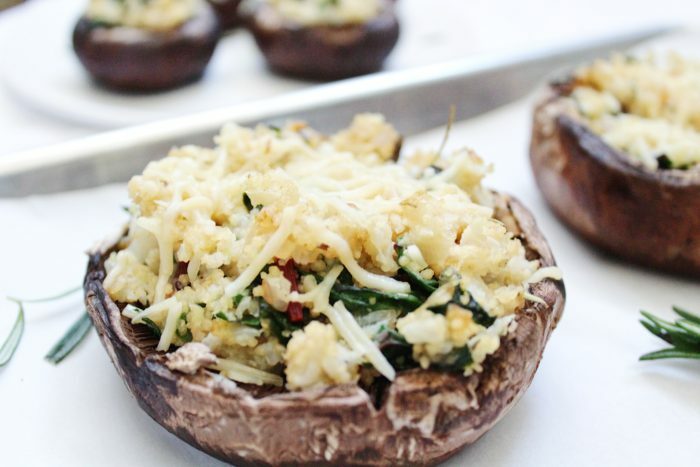 I love stuffed mushrooms because it uses a vegetable as the base rather than carbs, making it a healthier option. You can use either larger portobello mushrooms or small to medium sized depending on what you’re making them for. As a meal, I prefer to use the larger ones. The smaller sizes make great appetizers. 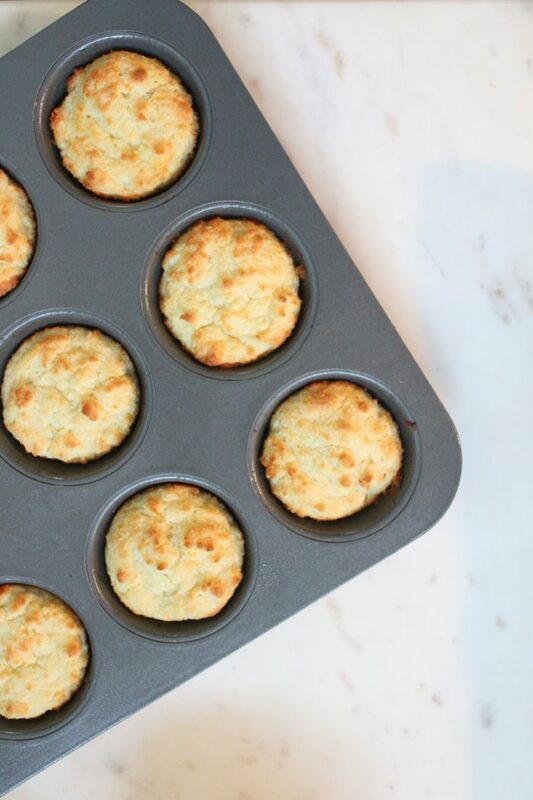 If there’s one thing that you MUST do in this recipe, it’s use REAL parmesan cheese. Please please please don’t use the kraft, perfectly manufactured into equal length pieces, fake parmesan “cheese.” Buy real parmesan in a block and grate it at home. It makes ALL the difference. If you’re vegan, then you can eliminate the cheese all together (so sad), and in that case I would add a little more seasonings/salt to make up for the flavor parmesan adds. Preheat the oven to 350 degrees. Cut out the stems and create a space for filling in your mushrooms. Prep a cookie sheet with sides with olive oil and brush olive oil on the mushrooms. 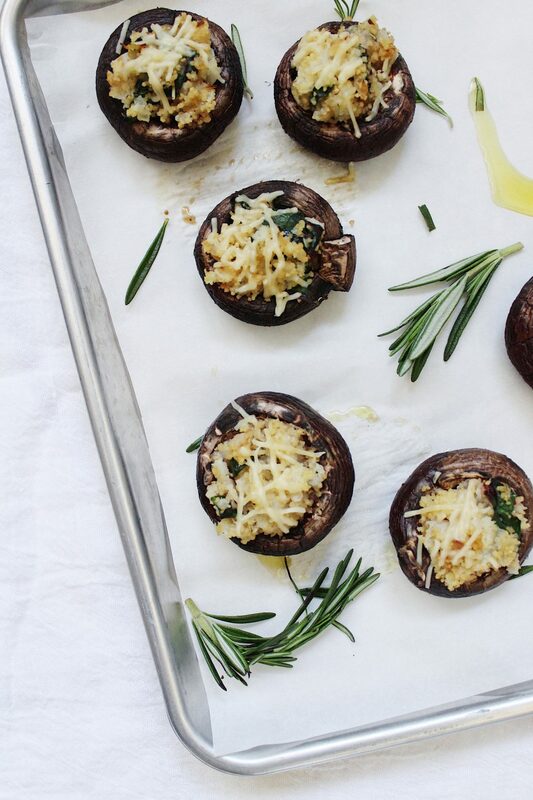 Sprinkle garlic salt on the mushroom bottoms. Cook couscous according to the package (you’ll only need to cook ½ cup). This takes 5 min. Boil cauliflower florets in a pot until soft. Drain and puree in a food processor or blender with salt and 1-2 tbsp olive oil. 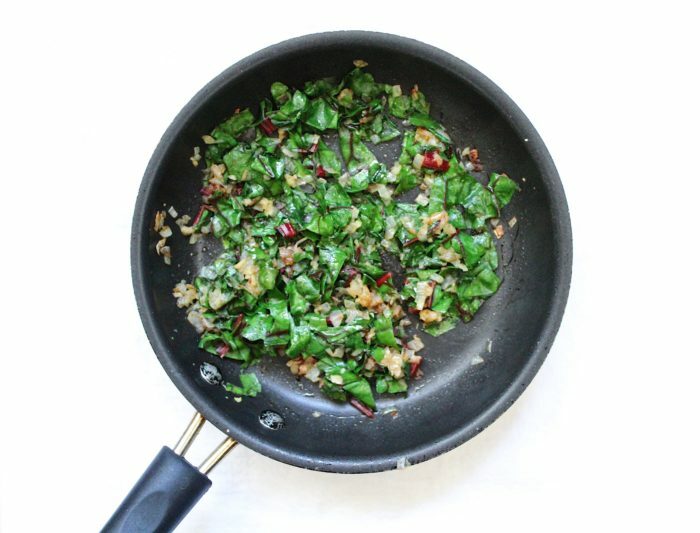 Chop the shallots and greens into small pieces. Heat olive oil in a pan over medium/high heat and saute the shallots and minced garlic for a few min. Add in the greens and saute another 1-2 min, until the greens wilt. In a bowl, mix together the couscous, pureed cauliflower, and greens mixture. Season generously with salt and pepper, garlic salt and chopped fresh rosemary. Bake for about 12 minutes or until the cheese has melted. Top with more fresh rosemary and enjoy!